iTalk Whoa! Enjoy Lowest Call Rate of 7 sens/minute! Do you have friends in other country that you want to call them because it is too far to meet them?? Enjoy the lowest call rate of 7 sen a minute to popular destinations that are US, UK, Australia, China and Canada. This special rates promotion starts from 15th July 2010 till 31st Dec 2010. Don’t forget to chat with all your friends anywhere in the world and update your twitter page through iTalkWhoa. 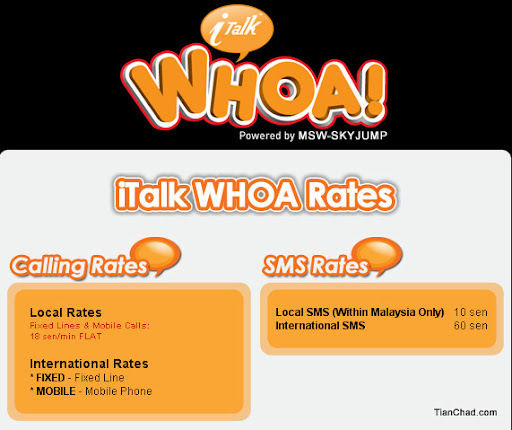 SMS to more people from iTalkWhoa for just 10 sen per SMS. Join iTalkWhoa now to get all the special deals. Login now to www.iTalkWhoa.com. All iTalkWhoa users can enjoy this rates promotion. iTalkWhoa is web based portal, therefore you are able to enjoy those same rates if you are making the call anywhere in the world.To make iTalk calls from iTalkWhoa, just login to www.italkwhoa.com. And click on the “Phone” tab. Choose the international destination and enter your phone number. Click “Dial” and enjoy the conversation. Do ensure that you have sufficient iTalk Credit before making any calls.The promotion rates are only applicable for iTalkWhoa users instead of iTalk for Mobile customer. To enjoy, register yourself now at www.iTalkWhoa.com.